Serving all of Arkansas, including Little Rock, Fort Smith, Fayetteville, Springdale, Jonesboro, North Little Rock, Conway, Rogers, Pine Bluff, Bentonville, Hot Springs, Benton, Texarkana, Sherwood, Jacksonville, Russellville, Bella Vista, West Memphis, Paragould, Cabot, Searcy, Van Buren, El Dorado, Maumelle, Bryant, Blytheville, Forrest, Siloam Springs, Harrison, Mountain Home, Marion, Camden, Magnolia, Arkadelphia, Malvern, Batesville, Hope, Centerton, Monticello, Stuttgart, Clarksville, Greenwood, Wynne, Newport, Osceola, Lowell, Beebe, Trumann, Heber, Morrilton, Pocahontas, De Queen, Warren, Farmington, Mena city, White Hall, Crossett, Alma, Berryville and Helena. Free Consultation & Design Estimates. Call 479-790-8209. Celebrity Greens is the Authorized Dealer, Designer and Installer of Artificial Grass, Artificial Turf and Artificial Putting Greens for the state of Arkansas. Since 2004 we have provided professionally installed synthetic turf in a large variety of public and private venues. Experts in landscaping, Celebrity Greens Arkansas understands drainage, slope, curb appeal, and the significance of using high quality products to perfect our turf installation process, whether it’s for artificial lawns or commercial applications. We always take a very personal and involved approach with all of our clients, big and small. As of 2014, we are the largest and longest existing artificial turf installation and design firm in the state of Arkansas. Our installations range from the smallest custom private installations to massive public contracting installations. We install all sports surfaces, as well as certified playground surfaces, and we specialize in designing and installing the most advanced synthetic putting greens available today. Our artificial putting greens can be installed indoors and outdoors. 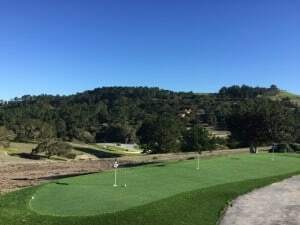 We offer a multitude of design features including sand traps, water hazards, custom lighting and many other amenities to excite the game of golf. We create professional tour quality greens that have true ball roll and at tour speeds that hold chips, pitches, and full shots like natural professional greens. Owning a realistic putting green greatly improves your short game and eliminates costly strokes as you approach the green in competitive play. We offer several custom flag and chipping pad options for each client’s particular project. Our synthetic putting greens can be as simple as a single hole back yard green to a dynamic true PGA tour Augusta “Nandina” replica and we provide all of this in a professional, economical, and timely manner. Contact us today and let us work with you on artificial turf lawn, playground, sports surface or putting green. If you have a unique landscape project that involves synthetic turf and you want the best quality turf installed by the most capable team of designers and installers, with the attention to detail that suggests you are their most important customer, then you have come to the right place. Celebrity Greens Arkansas offers complete landscaping services, and we are proud to offer products that require very low-maintenance while remaining lush and green through every season and all weather conditions. Contact us today for a free consultation!